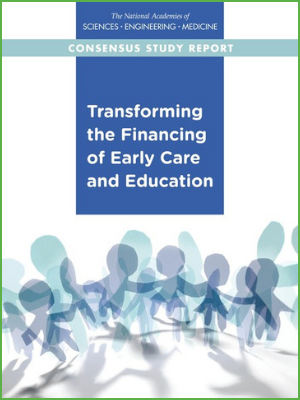 Transforming the Financing of Early Care and Education outlines a framework for a funding strategy that will provide reliable, accessible high-quality early care and education for young children from birth to kindergarten entry, including a highly qualified and adequately compensated workforce that is consistent with the vision outlined in the 2015 report, Transforming the Workforce for Children Birth Through Age 8: A Unifying Foundation. The recommendations of this report are based on essential features of child development and early learning, and on principles for high-quality professional practice at the levels of individual practitioners, practice environments, leadership, systems, policies, and resource allocation. This report was published by the National Academies of Sciences, Engineering, and Medicine. You can download the PDF version, read it online or buy it in print here.